Wells: I have news for you, Miles, you feckless loser: Oh yes, we are! The University of California at Davis offers the pre-eminent Vticulture and Enology program in the Americas, and has touched every winemaker in the world. The UC Davis Extension offers invaluable course material for winery and vineyardists of all levels of sophistication. I am certainly personal grateful for 25 years of constant learning through the Extension programs and valued personal friendships. One of the most popular courses is Successful Small Scale Winemaking. 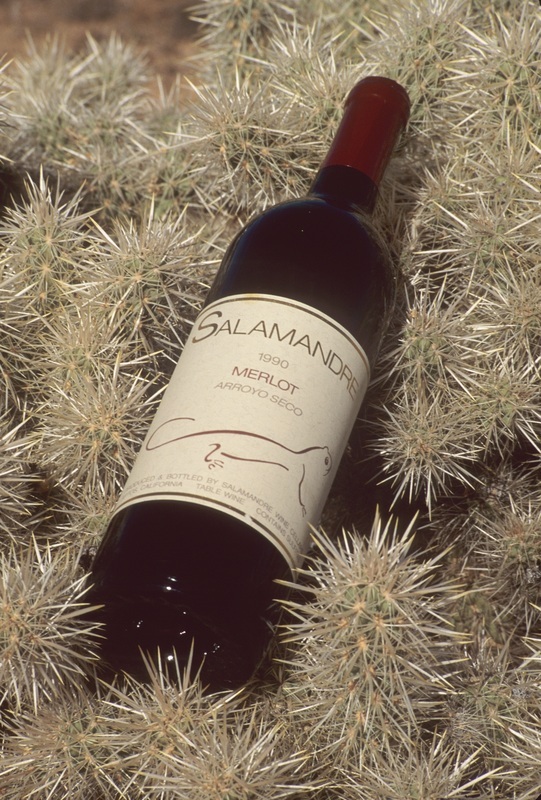 Course moderator Jim Lapsley PhD asked me to give the talk on Merlot production this April, and I thought some serious Salamandre enthusiasts would enjoy the insiders' perspective. Here, more or less, was the talk. Merlot 2003, Arroyo Seco Gold Medal in the 2005 Santa Cruz Mountains competition. Defying any stereotype of Merlot as the handmaiden to Cabernet’s pretension, this armwrestler will slam the Cab to the table with a thump, gulp his beer, eat his steak, and then steal his date with a swagger and a wink. In keeping with the theme of this course, Jim has asked me to talk about Merlot. I’m a small winemaker…well, actually more like a medium sized winemaker…of a very small, Mom & Pop, 1200 case winery now in its 21st commercial year. The wine we’ll be talking about today was a very small production—really on home winemaker scale of 200 gallons—and very tasty. And of course, regardless of the dimension of the winery, the bottles are pretty much the same size. It’s a French name that any doofus at an expensive restaurant can pronounce to impress his date with his sophistication. Pommard is the favorite French Burgundy for the same reason. It tastes really good with forward mainstream fruitiness that only a pathological sourpuss could criticize. The tannins are balanced in a way that allows you to enjoy the wine when it’s only 3-4 years old, in contrast to Cabernet. Restaurants could buy 5 cases and put it on the list without storing it for years, and have it really work with their food. Well capitalized dilettantes with manicured hands getting into the wine industry aren’t running up the price to salve the wounds from the rejections of their sexual overtures dating back to high school. The French Paradox television and press exposure raised widespread public interest in wine, red wine especially, and Merlot was standing right there to charm the new, curious drinkers. So here’s my personal confession. 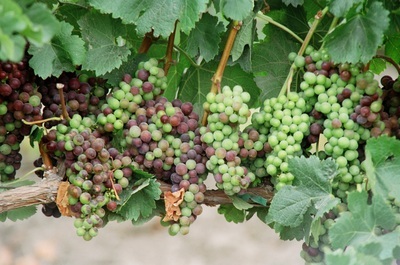 Yes, I know great wine is made in the vineyard…and the winemaker’s sacred duty is a stewardship to keep from despoiling the potential of the fruit. OK. Sure. Fine. It’s like the Star Spangled Banner…nobody’s going to quibble with that. Well, I do not grow grapes. Every time I talk wistfully about that, Sandie hits me with a stick…really hard. After countless bruises and concussions, looking at my imminent 60th birthday, I’ve finally come to grips with the realization that I am always going to be a grape buyer, not a grape grower…and so are many of the folks in this room. However, I only buy grapes from people I deeply trust and admire…and who share my aspirations for the wine and a degree of mischief. Personal relationships make the difference between ordinary and special, especially when you're small and have no economic leverage. I make wine from 5 vineyards now. My history with Merlot goes back to the very beginning. I tasted a fabulous Merlot from Stag’s Leap in 1977. I hadn’t made my first home wine yet, although the disease was incubating. The guy who got stuck giving us the tour at Stag’s Leap said it was his favorite wine on their list. Considering the source, that was pretty interesting candor. I still wish I’d bought more. I started making home wine that year. After 5 years as a home winemaker, I made my first Merlot from Arroyo Seco in 1982. It was so darned good that I kicked myself (and still do) for purchasing only a half ton. I kick myself even more for not recognizing what was right in front of me. I made the next Merlot in my first commercial year in 1985, but I was constrained by the common small winemaker’s self-imposed mandate to try to emulate the big guys, beat them at the quality game, and be technically precise. Back then Merlot was regarded by California winemaking conventional wisdom as a blending wine whose place was giving bent knee services to big, bully Cabernet Sauvignon. I had planned to make a Claret—intending to blend the Merlot with Monterey County Cabernet. Cab at that time was a challenge, contending with a lot of green pepper pyrazine from the overcropping and canopy management that once upon a time was a problem in Monterey County. The other blending companion was Carmine, which had the same problems, but boasted an amazing blackness and an arcane flavor profile which, alas, never quite took off. I loved my 2 barrels of Merlot much more than the other components, and with great equivocation, I blended it in. The only purpose of blending should be to make a product better than any of the components separately. Otherwise, what’s the point, especially for a very small operation. It’s morally wrong to use a fabulous wine in a blend that turns out to be just OK. None of us live long enough, nor have enough fabulous wine in our hands, to make that mistake knowingly. Anyway, a few more hard lessons, an earthquake, and some attitude evolution later, I started making Merlot on its own in 1989, sometimes with 10% Cab if it needed some tannic backbone. I missed the tide of “enological innovation.” Golly, I never was hailed as a pioneer visionary guru, and my volume was dinky in the most charitable measure, so I never tasted either the glory or the money of the Merlot boom, but I have loved Merlot for decades. The Arroyo Seco Vineyard in Greenfield probably lies on the margin of where Merlot should be grown. I’d say that out of 4 years, one will be too cold, and the wine will be sound but thin and ordinary. Perhaps 2 years out of 4, it will be full, pleasantly full of plum and black cherry fruit, and make very creditable wine. It loves American oak and just scratches its back like a fat cat in summer with that vanilla. And one year, maybe one with a steady, long, warm summer without vagaries of heat spells and nasty early rains…it goes over the top. 2003 was one of those fantastic years. For quite a few years, I have been making a 50/50 blend of Clone 3 and Clone 9 Merlot from Arroyo Seco’s UC Davis FPMS stock. Clone 3 is soft, not deeply colored, but absolutely rich in the plummy seduction of Merlot. Clone 9, which I started using later, is deeper colored, with more tannic backbone, with more of the cassis and black fruit components that might typically be more expected from Cab. The blend really improves both. I like them best at 3-5 years, but they actually age remarkably well. The ’90 and ’91, for example, are drinking beautifully. My life was complicated in the Fall of 2003. I was in a personal pickle, pinched for peace, time, and money. I had resolved to be modest in volume for the harvest, and I was cutting back on the number of wines I was making. I had been planning to blend the Merlot with Syrah and Primitivo for a proprietary blend…but I changed my mind when I found out what I had. I wasn’t going to repeat the mistake of 20 years previously. The crush was either The Three Stooges, or an elegant example of operational contingency mitigation, depending upon how charitable you are with your jargon and what degree you have. I have a daytime job, so I drove down to the vineyard after dark to pick up grapes that had been picked late that afternoon. I got just one truckload—2/3 Clone 3 and 1/3 Clone 9. Of course, now I wish I had gotten 5 times that much. When I got back to the winery, it was after 10 PM on October 28, and it was plenty cold. The moon was barely a sliver. I had two helpers, both of whom are fabulous commercial chefs: Jack and Lynn. There are no better helpers. The only occupation more demanding than restaurant operator is dairy farmer. Chefs are no strangers to hard work and nasty surprises, and they don’t whine. My trusty Zambelli stemmer-crusher, loyal and hardworking, picked this night to declare it was finished with harvest. After the second lug, the gears stripped off and it just sat there going clunk in the dark. Well, that pathetic performance just isn’t even worth profanity…you have to expect this stuff when you’re a small winemaker. So we dumped the lugs straight into the fermenter—a 5 foot diameter SS tank with 4 foot sides, took off our pants and started treading…the laughter and then, unapologetically, the music, started rolling out into the trees. By the time we were done, most of the grapes were crushed, a fair number of the slightly puckered grapes were still intact, and the stems were all there. I guess a marketer could prattle that this was our innovative approach to partial, selective whole berry gently crushing. Calling it “hands on” winemaking wouldn’t be quite anatomically correct, but it was plenty traditional…and entertaining. OK—one can’t give a talk on this campus without some quantitation. Merlot, once it hits ripeness, tends to shoot up sugar and lose acid pretty fast. Missing this optimum picking by a day or two isn’t lethal, but 4-5 days makes a difference. When the grapes just begin to lose turgor and get a little “golf ball pucker,” you need to move quickly. I think I was close to that deadline. The sugar of my Merlot was 27.3 at crushing…now that’s pretty high, but the juice was just practically vibrating with enthusiasm. There was no raisiny/burnt flavor…it just tasted intensely fruity. It tasted deficient in acid, however, and since my pH meter was broken, and I wasn’t about to measure a TA at midnight in my skivvies, based on taste and working with these grapes for 20+ years, I added tartaric calculated to + 2 grams/ liter. I added no SO2 because I positively hate working with the stuff, and I sure as hell didn’t want to be prancing around in a vat with any of it! These grapes, when overripe, tend to be nutrient poor, which can be a problem for sulfide production, so I added Superfood and DAP, both at a generous dose of 4 pounds/1000 gallons. I inoculated Fermirouge yeast immediately after crushing, and it performed honorably. Freeze dried ML culture was added directly to the must at 18 Brix. The fermenting must was extraordinarily fruity, and I pressed at 2 degrees brix at 11 days. I was a little anxious about letting the fermentation go quiet, considering I’d used no SO2. Because there were still a fair number of unruptured berries, I took our time with a very patient hydraulic basket press, raking up the cake more than I usually do with reds. I wound up with only 3 barrels, but I knew it was special. It was black, intense, shamelessly fruity, with plenty of tannin. I put it in new and one year-old American oak barrels. I racked it only once…in mid summer the following year. In the fall, I decided to bottle it alone, rather than blending, and did so in January, 2005…after 14 months in barrel. It won a gold medal in the Santa Cruz Mountain wine competition in 2005. Murphy’s Law never misses a trick in a small winery. It was in short supply and sold out practically immediately, and I could have sold 4 times that much right out the cellar door. When Jim called me about this course, I squirreled away 2 cases and I’ve somehow resisted my hedonistic impulses to dip into the stash…but today the mandate for discipline is now officially over. We’ll be tasting it later, but I’ll summarize with a few points I’d like to leave. Merlot is not a stepsister wine. Overripe is better than underripe for Merlot. Be generous with tartaric additions. Don’t sweat it when your tools break…remember how they did this stuff in the old days. Buy your own barrels. Using somebody else's used barrels is like borrowing their used handkerchief. Yuk. Never bottle bad wine. You have too much to lose when you're small. Don’t be a slave to formulas and “Thou Shalt” conventions. I'm a child of the 60's, anyway, so I don't need to be told…. If everybody did just what they were supposed to, we’d never have Champagne, late harvest Riesling, Sauterne, Australian wine, most of our successful blends…and wine would be simply too boring.